APC sets the standard in its industry for quality, innovation and support. Its comprehensive solutions, which are designed for both home and corporate environments, improve the manageability, availability and performance of sensitive electronic, network, communications and industrial equipment of all sizes. 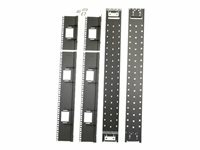 The mission of APC is to improve the manageability, availability, and performance of information and communication systems through rapid development and delivery of innovative solutions to real customer problems.This product is an APC Recessed Rail Kit for Netshelter SX 42U wide 750 mm.